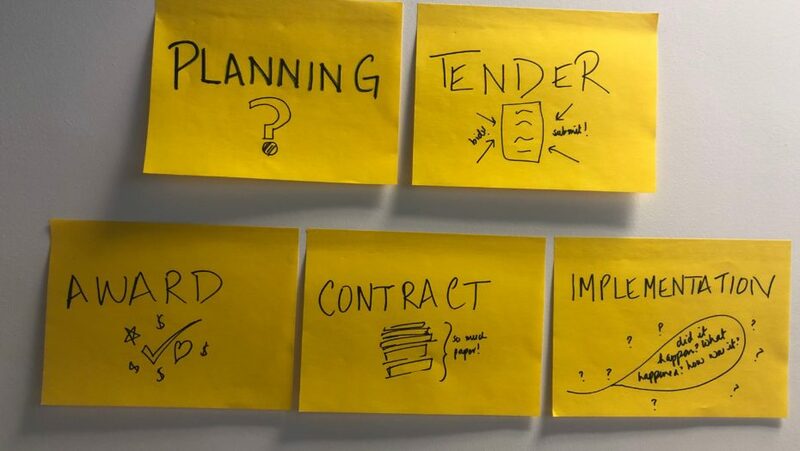 If you’ve hosted a workshop on open contracting, you are probably familiar with the feeling of having allocated 1 hour to OCDS discussion that ends up taking up half the day. I wanted to understand why this happens. Partly it is because of the complexity of the procurement landscape and the depth of the data standard but partly it is because of the way we talk about it. I found that for any audience who isn’t a procurement or technology expert, though the stages make sense, the fields and the structure do not. And let’s not even get started on identifiers and JSON (insert who is this JASON dude joke). Who else has had someone come to them after a talk or presentation and ask where they can buy the license for OCDS? The feeling of your heart sinking into your chest because you just realised no one understands what OCDS is. There are some words that trip people up: platform, standard, and schema. A map, a template, and a framework might be less accurate but it gets the point across. One morning, sitting at a hotel lobby eating a rather exciting plate of breakfast buffet (aren’t those the best? ), I was dreading the OCDS part of my presentation to a group of traditional (as opposed to data) journalists. For such cases of emergency dread, I keep a batch of yellow post-its inside my diary. I started sketching a skit. What if each JSON bracket was a human, and the different characteristics of that person became the data fields? That’s how it started. When I ran the exercise, it was a roaring success. It breathes life into the OCDS. Here’s how you can do the same. Scenario: You need to get the help of the room to come up with this. What is being procured? Who is doing the procurement? Get everyone to stand up (if they can) and line along the sides of the room. Label five areas of the room or a large table with the procurement stages. Use the post-its and write in a large font. Now you need a scenario. Ask the room to choose a procuring entity. I usually choose one that everyone knows about, such as the Presidency, Health or Education. You want to get through this quick so don’t let anyone get into a discussion. This is about quick decisions. Then, ask them to pick a common good or service. The simpler, the better though if you have a crowd that knows procurement, you could choose a complex one that requires outsourcing and subcontracting. Now you tell everyone it will be an open and competitive process (to make things simpler). Time to determine the stakeholders. Has this been commissioned by the minister? Make up a story. If yes, ask someone to volunteer to be the minister. Now we have a political figurehead. Next, we want to choose the procuring officer. Make the minister and procuring officer stand next to each other in the middle of the room. A good time to introduce the concept of “buyer” and what it could look like in data e.g “Ministry of Education”, “Buyer ID”. We want someone to be data users too so let’s pick some citizens, civil society, aspirant government contractors, and journalists. Make everyone wear a post-it note tag or a name card with their roles on it. Now walk to the side of the room that represents the planning stage. First task: we need to get a planning document. Get someone to be the planning document then discuss with the room what sort of things should be involved in the planning process. Is there market research? What will be procured? For how long? Where will it be advertised? You can give the “planning document ” an A4 sheet. Whenever you hear a field that is in the OCDS, tell the room that and get someone to put that on a different coloured post-it and put it on the planning document representative’s paper. This is also the place to introduce the “Open Contracting Identifier (OCID)” and attach it to another person. Discuss that the planning document will become the tender document. So now get a volunteer to be the tender document. You can get the planning document to do a high five or any other form of interaction with the tender document to mark the completion of this stage. It’s now time for the tender document to run (people love the running aspect because workshops make everyone’s back ache) to the tender stage. Get the OCID to run to the tender stage as they now become part of the tender data too. This is the time where you want to call on the participants representing private sector to start naming their companies and submit bids. A good time to share the importance of bid information especially with the lens of the stakeholders (including the minister). Get the companies to go to the tender document and submit their bids (post-its will do). Get the “buyer” to choose a successful contractor. Now this needs to be announced. Get the OCID to run to the award stage as they now become part of the award data too. Ask the chosen contractor to walk to the award stage. This is where you can introduce the “supplier” cluster within the OCDS. This relates to the many fields that come under supplier such as name, unique ID, contact details and addresses. Ask the room to shout out what information they would want to know about the “supplier” and when you hear a OCDS field, get them to write it down on a post-it. This is the best time to discuss company identifiers and where they could be sourced. Ask them how they can tell this company (e.g “Apple Services Ltd”) is not the same as “Apple Inc”. Someone might mention addresses would be a good way and then you can discuss why they are not! This is a really important stage as it is often the only information made public by authorities that don’t do open contracting, so each OCDS field should be assigned to a participant. Make them walk to the supplier. Now discuss data types and format. People will often suggest “name” or address is a good identifier. This is also the place to talk about directors and beneficial owners, and what information you would want to know about them. You want to talk about the date of birth, address, nationality and why these details would be important in investigations or due diligence. Beneficial owners are natural persons who own, control and benefit significantly from a legal entity such as a business. See OpenOwnership for more resources. If your crowd is full of seasoned professionals, you could bring this activity up a notch by asking them to identify other databases this information could come from e.g. company, beneficial ownership and tax registers. Now walk to the contract stage and take the “buyer” and “supplier” with you. This is a trickier stage because most countries don’t publish contract documents. This is a good time to talk about what information is and should be captured here, such as product specifications, milestones, dates and reporting requirements. Get the OCID to run to the contract stage as they now become part of the contract data too. Discuss contract amendments and how they should be disclosed. The contract has been implemented. Ask different stakeholders one by one what they want to know about the completed process and then discuss what should be public and what doesn’t have to be. Get the OCID to run to the implementation stage as they now become part of the implementation data too. Congratulations! You’ve now introduced the OCDS in an interactive and fun activity that they will most-likely never forget. The stages and fields have come alive. After this, it’s good to get people to talk about how and where they would know if there is a problem. Or what data is currently collected and published by their procurement authority. You can even start a conversation around what are the most important data points from what they have seen! If you run this exercise at your next workshop or training, don’t forget to let us know how it goes.